Almost 14 years after "Appetite for Destruction" and "Use Your Illusion", music photographer Robert John, known for his work as the exclusive photographer for GUNS N' ROSES during the height of their career, has forged a content partnership through Dark Moon Entertainment with Joost, a global web video service whose broadcasts feature television, film, and music programming via the Internet. 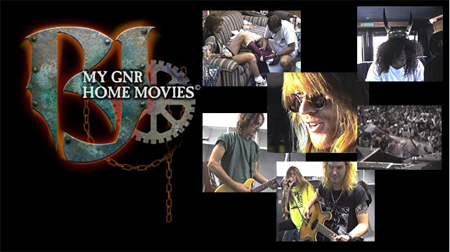 The My GNR Home Movies channel is available at this location. "Because I was so close to GUNS N' ROSES, I had access others didn't — as we did everything together. When I wasn't shooting photos for GUNS on tour, I would take out the video camera on downtime and capture the daily activities and antics on the road, more for memory's sake than anything," explains Robert. “The main thing fans ask me is, 'What are they like in real life?' I think My GNR Home Movies channel on Joost will give fans an inside look at the unique personalities in the GUNS camp, and what it is like to be friends with them. I'm starting out with just a few clips with interpreted details of my memories from each moment in time, and plan to add more content later. I held on to my video diaries for the past 14 years and, aside from a few glimpses on television, fans have never seen the majority of my GNR footage. So, this will be a real treat and I'm excited to share it with them. Also, I plan to launch other channels with other bands I work with in coming months, so check it out and stay tuned." Joost launched its Flash-based web video service in October and features a number of social tools that are designed to help people communicate with each other, to navigate through more than 46,000 video assets and to integrate user expression directly into the service. A Joost application is also available for the iPhone and iPod touch. Danny Passman, global head of programming at Joost, said, "Joost is about providing a full experience for fans — and Robert John's GUNS N' ROSES home movies are a perfect example of how we're doing that. It's not just about the music videos, it's a behind-the-scenes look at the artists — and letting fans express their passion through groups and interaction. Oh, and for me, I just can't get enough of Axl Rose doing ballet."